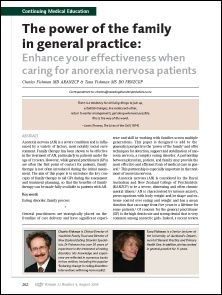 This paper by Charles Fishman and his wife Tana Fishman was published in the August 2006 New Zealand Family Physician Vol. 33 No. 4. Anorexia nervosa (AN) is a severe condition and is influenced by a variety of factors, most notably social environment. Family therapy has been shown to be effective in the treatment of AN, particularly in patients under the age of 19 years. However, while general practitioners (GPs) are often the first point of contact for patients, family therapy is not often introduced during the initial assessment. The aim of this paper is to introduce the key concepts of family therapy to aid GPs during the assessment and treatment planning, so that the benefits of family therapy can be made fully available to patients with AN. Download article: The power of the family in general practice [132 KB PDF]. Tana Fishman is a Senior Lecturer at the University of Auckland’s Department of General Practice and Primary Health Care. In addition, she has worked in general practice for 11 years, and is currently a partner at the Greenstone Family Clinic in Manurewa.